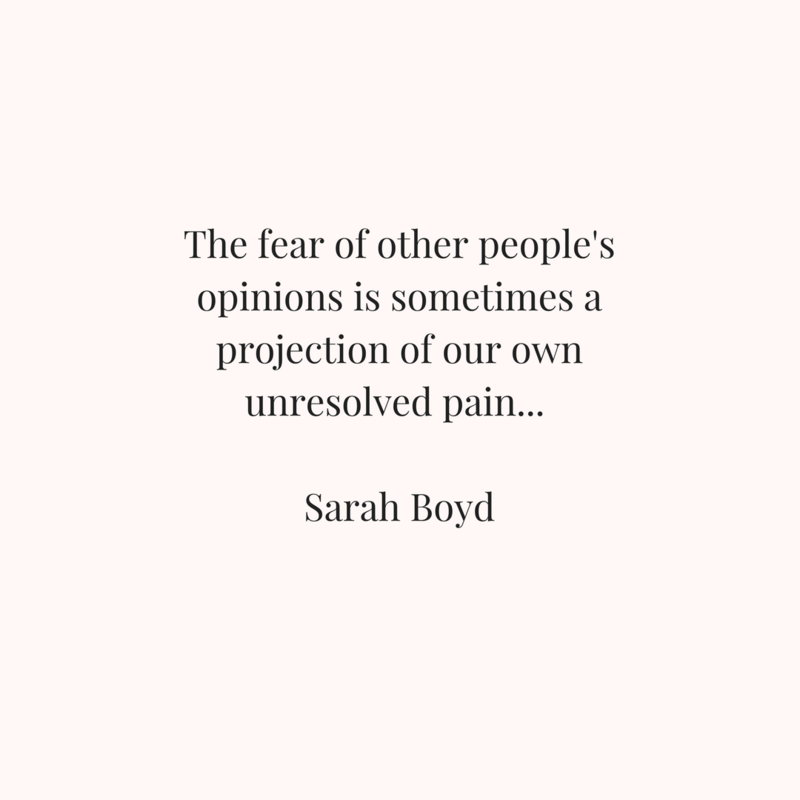 The fear of other people’s opinions is paralyzing. We live in a world that tells us our worth is based on other people’s approval of us. This fear can stop us from doing small things that we enjoy; but is most destructive when we are not our true selves or don’t go after the dreams in our hearts. I personally know this fear very well. 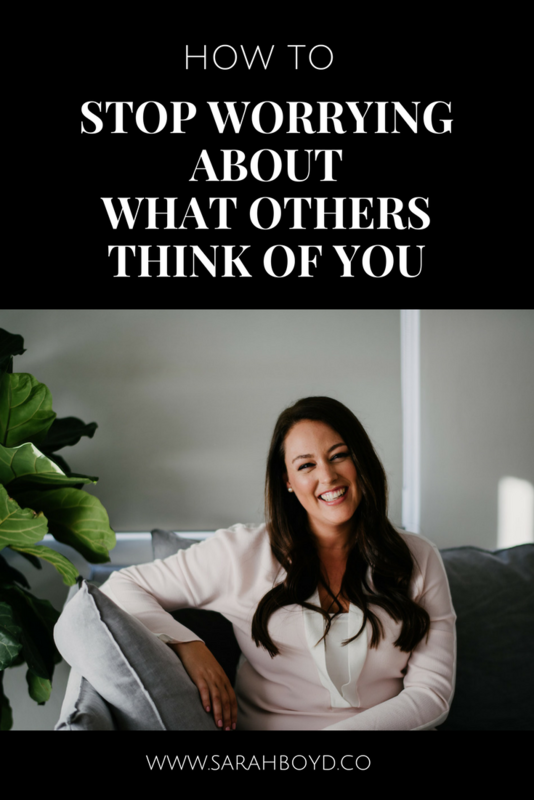 My story is that until my cancer diagnosis, I was completely paralyzed by the fear of what everybody else thought about me (you can watch my full story HERE). It was my primary driver when it came to making decisions. It was a cage that kept me from being honest with myself, about what I wanted to do, & who I wanted to be in the world. I desperately wanted to live my bigger, braver life, but I couldn’t. We cannot do meaningful, creative or visionary work if our primary motivation is to make people like us or think highly of us. We must go through the process of un-entangling ourselves & get internally free. Can you be specific about what you are worried about others judging you for? We all have a unique, negative script in our mind. What specifically are your current thought patterns? The truth is, we can often be projecting our own unresolved pain onto others. We are so scared that others are going to think ___________ of us, because on an unconscious level, we think it of ourselves. All of us have created beliefs about ourselves (positive & negative) from our interpretations of past experiences. When we haven’t investigated these beliefs (ie. found an awareness of what they are, where they come from), they guide all our life’s decisions & focus. Awareness is the first step of this process. Anxiety often comes from focusing on the wrong thing. Even though it is fear & insecurity drive, the fear of other’s opinions is essentially a mindset pattern where we are focusing on ourselves. By switching the focus of our minds, we can become grounded in a present moment. Focus on serving – How can you best serve & help those around you? How can you best serve & help those around you? This shifts your focus to think about those around you. In the context of public speaking, you can become obsessed about what everyone is going to think of your speech (which will make you crazy nervous! ), or you can become obsessed about how you can help & be of the greatest service to the audience. Focus on something that scares you more. This was the blessing within the cancer diagnosis for me. I was confronted with a reality that was more scary that other people’s opinions – what if this was the end of my life & I had never at least tried to go after my dreams? Regret is scarier than judgement. When we are paralyzed by fear of other people’s opinions, we are usually not living out our true desires, creativity & dreams. 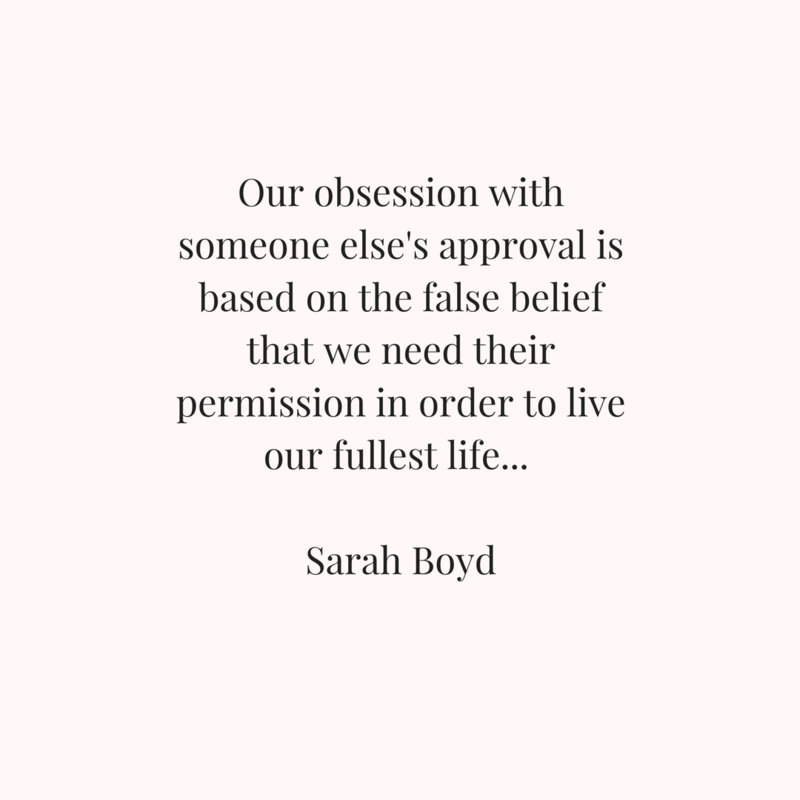 Often we become obsessed with someone else’s approval because we believe somehow that their approval will give us permission to be who we really are or to chase after the dream. The truth is you are the only person who can give you permission. We spend our whole lives waiting; for an opportunity; or someone to recognize our potential; or someone’s encouragement or approval. But the power of permission was always only with ourselves. 4. Identify who’s opinion you’re actually scared of. When we are scared of “everyones” judgement, the truth is we are usually only scared of a handful of people. You probably know who this handful of people are. They are the faces & names that come into your mind when you think about showing up differently in the world. From a psychological perspective, we take on our interactions with our close loved ones (parents, mentors or friends), & generalize their opinions & perspectives, to the rest of the word. Then we say we’re scared that “everybody” will think ____________ of us. The truth is we’re actually scared that ____________ will think that of us. And they probably already do. And you know they already do, which is why you’re so scared to take a step forward out of the box they have put you in. But because they probably already think that of you, now the power of the fear is taken away. What you feared is already in reality. So now what are you going to do about it? Does it mean they’re right about you? Or is that actually a reflection upon them & their unresolved issues? The truth is some people, because of their own past & issues, are very hurtful & even toxic in our lives. But until we wake up to stop blaming ourselves, or finding reasons we are responsible, we are never empowered to move forward. Other people’s negative reactions to you, are their responsibility. But if they’ve proven in the past that they consistently react negatively, why do you think it’s going to be different “this time”? What do you need to do to feel emotionally safe if they react negatively? Maybe it’s not sharing the details of your plans, or talking about certain topics, or creative a support team you can lean on when things don’t go well. 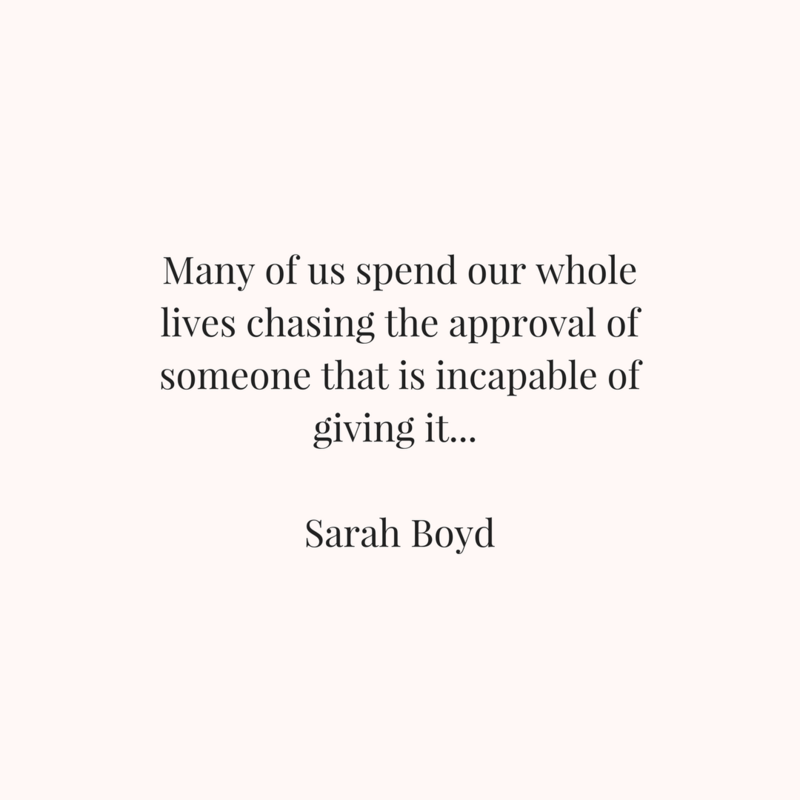 Many of us spend our whole lives chasing the approval of someone that is incapable of giving it. We are so entangled in this chase that it depletes our whole lives… we don’t show up as our true selves, we don’t purse our creativity & dreams, & we don’t take a stand for what matters most to us. 6. Its your job to educate, not learn. When you are creating something new, or transforming into a new identity, you are the visionary of the changes. You cannot expect everyone else around you to instantly be up to speed with all the new. We need to give others around us time to catch up to the new changes. We all have set ideas of who each person around us is & how they interact with the world. When someone breaks out of that, it is confronting to our psychological reality. And sometimes, if this change is only in seed form, they cannot initally see it. So don’t give your seed to others & expect them to see the vision of the tree & help it grow – that’s your responsibility. Your job is to educate those around you of what the seed really is. It may take multiple times of convincing, it may take longer than you would like, but eventually those around you will just accept the changes as normality. First they’ll ask you why you did it? then later they’ll ask you how you did it? This is the process of building any vision or creative work. That’s why if you enter the process looking for everyone’s approval, you won’t make it through the first stage. Overcoming the fear of other’s opinions is possible. Once we go through the process of un-entangling ourselves from negative thought patterns, the hurt of the past & toxic relationships, we can find internal freedom. With this freedom we are then able to show up fully as ourselves, and create meaningful & visionary work in the world that is of service to others.